In early 2008, an elderly woman drove her car through our back yard and took out a chain link gate. Her vehicle raced across the lawn, just missing a beautiful 30-year-old tangelo tree and a water fountain, eventually crashing into a fence where the corners of four properties met. Her insurance company paid us fairly to cover the total cost of damages, and so began my Great Gate Project. Back then, I thought about building the new wooden gate myself, but I didn’t have the time. I thought it might be more sensible to ‘hire a professional.’ I know this magazine is read mostly by professionals, and I don’t mean this as criticism of the entire industry, but believe me, not everyone who says they’re a professional is professional. For example, when my contractor’s crew started installing the flat 5 1/2-in. boards across the gate frame, they started on the left side and ended with a small 2-in. strip of wood on the right side, near the latch. I asked them to redo the boards, so they’d be centered—that didn’t earn me any friends. Of course, by the time I realized the workmanship was questionable, they were setting the finish. I later learned that that wasn’t the only area where quality was sacrificed for speed. After three years, the gate started falling apart, and the warranty was long expired. The concrete footings were crumbling, and could be broken with my bare hands. The posts were out of level, and the gate was dragging on the ground, despite my continuous adjustments. Rather than contract with the same company again, I decided to re-build the gate my way. I started by drawing plans for the upgrade in Google SketchUp. The design was much more structural, with a stucco wall extending off of the garage and a stucco pillar on the hinge side of the gate. The main challenge was dealing with the varying angles and grades. After many weeks of measuring, planning, thinking, and drawing, I came up with my final measured drawings of the foundation and wall structure. Some of you might be thinking: “Wow, if I spent that much time designing a simple gate, I’d never make a living.” You’re probably right! Fortunately, I wasn’t trying to make a living building this gate—I just wanted it to last. I chose to build the wall out of traditional wood framing instead of concrete block, because I’m not that experienced with block, which turned out to be a good decision. When I went to Building and Safety to get a permit, and showed them my plans, they told me that I didn’t need a permit for a wood structure fence—but I would need a permit if it were concrete block! The first step was excavation. This required a bit of irrigation work, jack hammering to get out some of the old concrete, and lots of digging. The total depth of the footing and stem wall was 25 in., but I dug a bit deeper to get to undisturbed soil. I then back-filled with 3/4-in. crushed gravel. I set up shop in my garage and got to work on the forms for the foundation. These were extremely challenging due to the multiple angles. Plus, I wanted to do a monolithic pour of the footing and stem wall, which meant that a set of forms for the stem wall had to sit on top of the footing forms. First, I set the forms for the footing. Next, I set the forms for the stem walls. I used #5, 5/8-in. rebar, drilled and epoxied into the garage foundation. My calculations were for just under a 1/2-yard of concrete. I rented a ready-mix trailer from a local equipment rental yard, which made things a lot easier. The forms made it easy to screed the concrete level and smooth. I set 1/2-in. j-bolt anchors, and let the foundation cure for 48 hours before starting framing. Most TiC readers probably already know that a wall that’s simply bolted to a foundation will never be rigid enough to hold a gate, but, being new to construction, I had to learn the hard way. I should have set a steel post at both sides of the gate, right into the foundation, and then framed around the posts. I didn’t know that. So, I re-worked the design. The new design required an addition to the foundation, which changed the freestanding wall into an “L” shape. More digging…more rebar…more forms…and more concrete. The next step was two layers of Grade-D building paper and 20-guage, self-furred stucco netting, which was installed with 1 1/2-in. staples with a 1-in. crown. None of the staples were installed on the flat horizontal surfaces of the wall tops, and they were kept 2 in. down the wall from the top edge. Also note that I didn’t install a weep screed. I specifically chose not to install this detail because it simply wouldn’t have looked good with our house, which was a 1927 Spanish Revival. I did, however, continue the lath onto the foundation, which was attached with Ramset nails. With building paper and lath installed, the project was ready for stucco. The scratch coat came next. Then came the brown coat, which brought the thickness out to the same level as the existing garage wall. Finally, the topcoat. Our house had a skip trowel texture, so blending the new section to the exiting stucco was relatively easy. I kept the wall moist for 72 hours while the stucco cured. Additionally, the stucco had to cure for at least 28 days before painting. I chose not to use a colored topcoat, because our house was painted. The next step was to start working on the brick pathway and threshold leading up to the gate. I started with excavation, then 4 in. of 3/4-in. crushed gravel, and a 4-in. slab of concrete with 6 in. wire mesh. The photo to the right was taken just after I bull-floated the concrete. After the water bled out, I floated and lightly scratched it to give the mortar something to grab onto. Brick was set in a 3/8-in. bed of mortar. A masonry saw was used for the handful of angles. Grout was completed the next day, and the brick was washed with muriatic acid. Finally! It was time to build the gate! I have to admit that during this whole process, my wife and I hadn’t decided on the gate design. We couldn’t even decide between wood or wrought iron, which meant that I couldn’t install the proper jambs. Of course, I didn’t want that decision to hold me up, so I stuccoed the entire wall. Ultimately we chose a wooden gate—with mortise and tenon joinery and floating panels. For a wooden gate, I would have preferred to install the jambs before the stucco, and then key the stucco into a rabbet at the back of the jamb, but that’s not how things worked out. Even though I have a pretty good shop at home, I felt that I needed more space, and a few tools I didn’t own, like a bandsaw, so I used a local professional wood shop that a friend of mine uses to build furniture. The shop had three table saws, one of which was an Altendorf sliding table saw. This was an absolutely awesome machine to use! They also had a hollow chisel mortiser, oscillating spindle sander, oscillating edge sander, bandsaw, and many more fine tools that aided in the gate construction. I chose Vertical Grain Douglas Fir, because it was readily available without special order. Honestly, I wanted to build the gate out of Cedar, but it was special order, and I couldn’t wait. The gate design was to be strictly mortise and tenon joinery without any fasteners or pins, and the center panels would float in a dado. There would be a total of four rails, which I designated from the top down as: Top Rail, Top-Middle Rail, Bottom-Middle Rail, and Bottom Rail. The two Middle Rails would have standard tenons. The Top and Bottom Rails required haunched tenons, because of the dado that ran the entire length of the stiles. I started by milling the 2×6 stock for the stiles and rails. The first step in the process was smoothing one edge on a jointer. The next step was smoothing a face on the jointer so that these two surfaces were square to each other. After this, I ran the opposite face in a thickness planer to achieve my final thickness of 1 3/8 in. Finally, the last edge was ripped on the table saw to a width of 5 1/4 in. The next step involved setting up a 1/2-in. dado blade on the table saw to cut the dados in the stiles and rails. These were cut to a depth of 3/4 in. The inside edges of the stiles, both edges of the two Middle Rails, and the top edge of the Bottom Rail had a through dado cut in them. The dado in the bottom edge of the Top Rail was not cut at this time because of the curve—this will be discussed later in the article. The setup was simple: install a 1/2-in. wide dado blade, set the blade height to 3/4 in., and set the fence to 7/16 in. away from the blade. Each piece was cut once, turned end-for-end, and then cut again. This ensured that the dado was perfectly centered in the workpiece. After cutting the dados, it was time to start drawing and creating the curved template for the Top Rail. I had to create the template before cutting the mortises in the stiles, because it would indicate exactly where the Top Rail and Top-Middle Rail would be. I laid out the radius-to-rail the Egyptian way: I drew it full-scale on a piece of 1/4-in. plywood, so I could get the right curve. I didn’t have a specific radius in mind for the curve, so I set up trammel points on a long piece of scrap stock and played around. The final radius I chose was 36 in. I drew the bottom curve, and then moved the pivot point vertically up the centerline 5 1/4 in. to draw the top curve. From there I drew horizontal lines perpendicular to the sides, one at the apex of the top curve and another at the bottom points of the bottom curve—these are labeled as Top Line and Bottom Line in the following diagram. I also drew vertical lines 5 1/4 in. in from each side to represent the width of the stiles. Once the template reached this stage, the template was cut exactly on the two outside parallel lines, which represented the gate width. I cut the template a few inches above and below the Top Line and Bottom Line. The exact distance away from the Top and Bottom Lines didn’t really matter, because the template would eventually be cut later at the curved lines. The top rail template with haunched tenon layouts on both ends. The gate was six feet tall at the top of the curve, so I measured six feet up from the bottom of each stile. I then placed the template on the stile with the Top Line aligned with the six-foot mark. Next, I marked tangent points at stiles A & B.
I also measured and marked the layout of the tenons on the template. There wasn’t any exact science here. The tenons on all of the other rails were 3 in. long, but the top rail was special because of the curve. I settled on a length of 2 in.—the deepest I could go into the stile and still leave a fair amount of material near the top edge. I cut the plywood template with a jigsaw and smoothed the curves on an 8-in. oscillating edge sander. Using the template, I marked the tops of the stiles, then measured and drew the exact location of the Top Rail mortises based on one of the lines drawn on my template. These reference points and lines allowed me to measure down the stile to find the location of the Top-Middle Rail, which was 5 1/4 in. below the Top Rail. The Bottom-Middle Rail was located and marked by measuring 5 1/4 in. up from the top of the Bottom Rail. With this information, I was able to lay out the exact locations of all the mortises with lines drawn on the faces of both stiles. Afterwards, I transferred the lines to the edges, which were ultimately referenced when cutting the mortises. Mortise layout for the Bottom Rail and the Bottom-Middle Rail. I used an Oliver #91-D Vertical Hollow Chisel Mortiser to cut the mortises. (Unfortunately, I didn’t take pictures of that process.) With the mortises completed, I went to work on the rails. I cut them all on a chop saw to a length of 35 3/4 in. (29 3/4 in. for the length of the rail between the stiles, plus 3 in. for each tenon). I cut the Top Rail to the same length, even though its final length would be 2 in. shorter because of the 2 in. tenons. Having equal-sized rails made it easier to maintain perfect layout tolerance on the center sections. I cut the tenons on a table saw using a dado blade, and I set a rip fence as a stop for the tenon length. After making the initial shoulder cut, I moved the material away from the fence and removed the remaining waste. I used a band saw to cut the haunched tenons (see photo, right). For the curved top rail, I just traced my template onto a glue-up of 2×6 stock, which was wide enough to get the full radius. I cut the top rail with a band saw and sanded close to the line with an oscillating spindle sander. I smoothed the stock using a Stanley #113 circular plane. All of the rails are complete, with the exception of the dado on the bottom, concave side of the top rail. To cut the dado in the radius top rail, I used a 1/2-in. slot cutting router bit with a ball bearing guide mounted in a router table. A 1/4-in. dado was cut down the center of one edge on each board. The panels were milled from 1×6 lumber to a final thickness of 1/2 in., and a width of 5 1/4 in. The final width of the panels would be 30 3/4 in., and would be made up of seven individual boards. This would allow for 1/2 in. of expansion. Each board was tongue and grooved and glued together. The tongues and grooves were made on the table saw, but I started by milling the grooves first. I cut the tongues next, keeping the board oriented vertically with the face up against the fence. An alternative method would have been to cut with the face against the table. Either way would have worked, but a zero-clearance insert was mandatory when cutting it in a vertical fashion. Also note that a featherboard was used when cutting both the tongues and grooves. Using a dado blade and a zero-clearance insert, both sides of each board were cut with the same setup, resulting in a tongue perfectly centered. Bevels on both sides of the groove edge were cut on the sable saw with the blade tilted to 45 degrees. Bevels on both sides of the tongue edge were cut with a shoulder plane. When assembled, a simple V-notch groove was formed between each board. The individual boards were glued and clamped together using Tightbond III waterproof glue. After the glue set, the panels were cut to final dimension and pre-stained. I used Cabot Solid Color Acrylic Decking Stain. I chose this finish because it didn’t need priming, and soaked into the wood instead of remaining on the surface as a film, like paint or polyurethane. I didn’t want to use spar polyurethane, because of the way it yellows and flakes with age. I think the long-term maintenance of the decking stain will be easier—just a fresh coat every three to five years. I also pre-stained all of the dados in the stiles and rails before assembly. The next step was assembling the gate. The gate was glued and clamped, using Tightbond III waterproof glue. The center panels floated within the frame to allow for expansion and contraction throughout the seasons. However, I used a small bead of “Big Stretch” acrylic latex caulking on the bottom edge of each panel, on both sides of the gate, where it fit in the dados. This will, hopefully, inhibit any water from getting down into the dados. The stiles were left long during assembly, but after the glue set-up, I trimmed the stiles and the Top Rail close to the line with a jigsaw. I then clamped the curved template onto the gate directly on my cut line, and used a flush trim router bit with a ball bearing guide. Because of a through-dado on the stiles, a haunched tenon was necessary on both the top and bottom rails. Gate installation was relatively easy. I installed the jambs on the stucco walls using 1/2-in. lag bolts. I used two 4-in. ball bearing hinges and an exterior door lockset from Emtek. I didn’t want a traditional gate handle. The jambs were installed to the wall using four lag bolts on each jamb that were recessed into the wood and plugged. The recess was cut with a forstner bit, and the plugs were cut with a plug cutter, then trimmed flush. After two coats of stain, the gate was finished (below, left). Once I put a bit of paint on the stucco (below, right), the project was finally complete. Once completed, we received many compliments from neighbors and friends who all stated the new gate and wall looked as if they had always been a part of the house. We agreed. First off, I wish I had built the gate 1 3/4-in. thick instead of 1 3/8-in. thick. This is for two reasons: 1. The gate is warping. 2. A thicker gate would have allowed me to use better hardware. I wish I’d fixed the design flaw of the free-standing wall earlier…while in the design stage, not the concrete stage. That would have meant a lot less stress. And speaking of stress, when it came time to pour the concrete, I ordered a half-yard. My calculations were just under this number, but I should have ordered 3/4-in. of a yard. I was freaking out during the pour, worried that I’d run out of concrete. But scraping the drum gave me just what I needed. Finally, I should have done a full mock-up of the gate, or at least drawn the full-size gate on plywood. As I mentioned earlier, I made a glaring error: My drawing and initial idea was for the top and bottom panels to be of the same height where they meet the stiles. Unfortunately, I laid out the mortises incorrectly and didn’t notice it until after the glue up when I stood back and said “Ugh!” Of course, my wife said they looked fantastic, and no one but me knows the truth. I would like to thank Peter Vogel for his patience and guidance with building the gate. Peter is an exceptional woodworker and artist. Additionally, I would like to thank Kirk Giordano, of Kirk Giordano Plastering, Inc., for his informative videos. Kirk’s videos show his level of expertise and professionalism, which aided me considerably in completing my project. Mike Boden is a re-recording mixer at 20th Century Fox, where he has worked since 2005. With over twenty years of experience in the film industry, Mike has also held positions at Universal Pictures, Sony Entertainment, and several other smaller studios. After college, Mike noticed that his mother’s home was in need of some serious repairs. Mike decided to tackle them himself, which served as a great entry point into the craft of woodworking and construction. From there he bought his first home in 2001 and embraced the opportunity to build many upgrades himself, which included a laundry room remodel, French doors, skylight, cedar closets, interior doors, landscaping, pergola, and much more. Woodworking and construction offer Mike a gratifying counterpoint to sitting in a dark studio, mixing audio. Mike dreams of someday having his own dedicated woodshop instead of a shared garage. When not working at the studio or on the house, Mike enjoys traveling with his wife, cooking, playing with his three dogs, and photography. His photography portfolio can be viewed at www.mikeboden.com. Absolutely fantastic job and what a great project you should be very proud I think it looks great and a contractor would have charged a small fortune. I am always jealous of you multi-talented people who seem to be able to tackle any project a house throws at you. I have to admit that I cringed at the solid body stain on the vertical Doug fir. It is one of my favorite species and I love its natural color, but you did have to match the rest of the house. Quite understandable. Well done! Gates are not that easy to build correctly. Most gates I’ve seen are in varius states of disrepair. I have a gate on my house that works well. I plan on putting a garage opener on it one day. not sure how that will happen. I want the garage opener on it for bicycle entry. Should be interesting to make happen. Check with your local hardware store for a remote controlled swing gate actuator assembly. Several companies make them, and they come in various sizes. 3 ft., 5 ft., 6 ft., 8 ft., and 12 ft. are the most common single swing sizes. I have installed a few for elderly and handicapped people, the brand name is not important to me. My only caution to you is make sure your gate swings plumb in the complete swing, otherwise the mechanism will get into a bind. The actuator will not care either, it is designed to push and pull a certain distance. Once it starts the cycle, it will push the mechanism through a brick wall if the wall happens to be put within the stroke distance. How are you going to talk your wife into buying that new $20,000 saw:-) Guess you’ll have to choose a bigger project! Great job. You are correct in that it is the design and planning that really take work. Cutting, glueing, nailing…that’s the fun part. haha…good one! I think I’d have to actually build her dream home to justify a tablesaw at that price. Nice job, and a very well written article! Mike you did as good if not better job than any contractor I have seen in a few years. As far as the different lengths on your inserts, get your ruler out and measure (probably your own garage doors) the inserts on any home of that vintage. You will find the top section is always longer, some by as much as 1/3. I can’t tell you why, but after a few years in south Florida your gate looked perfectly natural to me. Making the gate thicker would basically just made it heavier. I do not know exactly your orientation to the compass, but I’m going to guess your house faces more to the north. Your gate is drawing due to the amount of sun exposure on the solid surfaced gate. If you had cut a few slots, like in the center of every other board to let the gate expand during the heat of the day, it would stand for as long as you will be around to look at it. Anyway, as far as the warping is concerned, it’s really not that bad. When I initially installed the stops on the jambs, my tolerances were probably a little too tight. So the warping simply prevented the gate from latching due to about a 1/4″ of deflection at the top and bottom of the gate on the strike side. I was able to correct this by using a shoulder plane on the stop to provide a little more room. (Of course…I glued the stop to the jamb!) Now that it’s been through a year of seasons, there isn’t a problem anymore. The weight of the gate was one reason I built it 1 3/8″ instead of 1 3/4″. But what I didn’t realize at the time was that the thinner gate really limited my selection of locksets. As it stands now with the current lockset, I had to purchase an additional bushing for the deadbolt to accommodate the thinner gate. Great article! As someone who works with gates and gate hardware every day, I was nervous when you said you installed a passage set. The door hardware’s throw is shorter, so the tolerance has to be tighter than gate hardware. Sometimes the movement of the wood causes binding or if it shrinks, the latch can’t engage. It sounds like you did have a little trouble, but that it’s all solved. It looks beautiful and seamless and like a natural extension of your home. Great job! My respect for bringing a job like this to a good end .I am a “part time” woodworker myself so I know of the difficulties you have encountered. What a beautiful job. I admire your excellent tellIng of the story as well. Wonderful photography and clear description of your thinking and your work. You are inspiring us all! Great job, Mike. I especially appreciated the part where you fess up about what went wrong. I’m a remodeling contractor/cabinetmaker with over 25 years of experience & still make mistakes. I figured I would have attained perfection by now, but I find that fixing my mistakes is where I am most creative. Wow, what a project ! When I first started doing woodworking all I wanted to do was “build it”. I had to learn the hard way the lesson you so admirably demonstrate here: it is so important to design it before you build it and even design it and then model it and then build it!!! You are a great model for aspiring wood freaks like us. It doesn’t start in the shop, it starts on the design table. Beautiful design, extremely well thought out, and very well executed. We all learn something from each project; so don’t beat yourself up about the little things. Now, you need to install a huge bollard in front of that gate so that no errant automobiles can take it out! Thank you to everyone for the kind compliments. I was a bit worried that I wasn’t going to be so welcomed because I don’t do this for a living. And thanks to Gary and Robert for their hard work editing this article. That alone was a great learning experience. Because of Gary’s input, I now know that I should have embedded a steel post in the foundation. If I was to do this over, the new challenge would be finding out what type and size of post to use and where to purchase it. The devil is in the details, which is one reason why the project took me so long. Gates, decks, and fences are interesting projects from a price point of view. As you noted at the beginning lots of customers choke on the price and of good quality work and choose to either do it themselves and live with the results or hire a cut-rate contractor. On the other hand hack ‘contractors’ see easy money in deck and fence work and price themselves above their abilities knowing that the market will likely bear it. It’s one of those many areas in which nothing beats a word-of-mouth referral. Wow. I build some beautiful things, but I never get to take them to the extreme that you were able to here. Problem? Where you paid maybe $500 for the first gate, it would take $5,000 to build a gate like this. But here’s the rub and what upset me about the original gate. It was failing after three years, and I didn’t feel as if it should have been. With just a little more time and effort, the concrete wouldn’t have failed and I never would have thought to rebuild it. Perhaps I’m wrong in this expectation? As I read I kept wondering that if the original contractor had proposed a solution similar to the one you ended up making (including a higher cost), would you have seriously considered it? While not often the case, I believe (because I have made the mistake) we underestimate our (potential) clients need for solutions that are not always “economical”. I think your point is true more often than we guess. Potential customers are interested in considering an economical option but would be willing to pay more if the benefits were clear and they had confidence in the contractor. I’ve made the mistake of underestimating a customers’ budget and so have lots of other contractors I know. Both the contractor and customer walk away disappointed when that happens. The original contractor didn’t offer any solution such as what we ended up with. And honestly, I don’t think that they ever would have. But interestingly, before we hired them, we tossed around the idea back then of what we eventually ended up with today. What it came down to for us was that I didn’t have the time or energy to start and complete a project of this type, and we didn’t want to shell out the money necessary to hire a contractor. Additionally, I didn’t want to put in the effort to find a contractor that could have done this job for us satisfactorily. So we settled with the simple gate using the original contractor. Good story, Mike, not just about what you did but what you didn’t do. I think Jeff said it so well and so succinctly; it’s possible some people might miss the significance of what he said. Very few people, particularly working-class people in our economic bracket, want to spend a lot of money. But some people–including many of us, won’t be satisfied with the results if real quality, aesthetic quality, is sacrificed because of a too-tight budget. As contractors, we have to find the balance of satisfying both needs for our clients. It’s a tricky dance. Often, if we continue to suggest improvements, our customers will begin to think we’re trying to inflate the the job cost; sometimes they’ll think we’re trying to take advantage of them. Of course there are other contractors who don’t have either the experience or the imagination to offer proper alternatives. There are also contractors who don’t know how to do a proper job, no matter what the budget is. I enjoyed your article, and I enjoyed the comments, because they both cover such a critical subject. It might seem like the theme to this article is: “If you want something done right–so that you’ll really enjoy it, and your budget is tight, you’ll probably have to do it yourself.” But the real point of the story goes much deeper and will hopefully help professionals learn how to help their customers a little more. Nice looking gate! You work like a craftsman and think like an architect for sure. I have thought about your article on and off all week… as well as the feedback posted by other. I wanted to post some additional thoughts that may seem critical, but only presented in an effort to improve the things we make. My main concern is that I think you have designed into your gate project an “Achilles heel” exterior detail. Specifically you have incorporated floating recess panel construction frame construction meant for interior environments and asked it to perform in exposed weather conditions. Over the long haul, it may end up leading to premature rot. Perhaps a bit of wishful thinking?? 1. The individual tongue and grove recess wood panels WILL expand and contract with moisture changes, thus breaking that bead of “big stretch” in relatively short time. How long your panels last without signs of deterioration depends on quality of initial seal coat, amount of exposure to the elements and number of repetitive wet/dry cycles it sees. In your climate it may not be as much of an issue, but here in Virginia it would probably show signs of deterioration in as little as 18 months. The natural ability of Douglas Fir to resist rot is not particularly high*. 2. Because of the way your caulk is applied, you are asking it to perform in a state of “infinite flexibility”. This is impossible for any sealant to achieve. Further, once the bead is compromised, it can actually start working against your detail in that the failed caulk can actually trap moisture that has worked its way into joint. This can allow microorganisms (fungus) to feed on cellulose for longer periods of time before joint dries completely and microorganisms die from lack of moisture. 3. The bottom ends of the tongue and groove panels drain into the “cup” side of dadoed rails which WILL trap moisture and exacerbate the issue of panel movement as they wick trapped moisture. It doesn’t really matter how well you pre-sealed the ends. Unless you have sealed the end grains of these panels with penetrating and sealing epoxy, they WILL wick moisture like a straw (even then they will probably wick somewhat over time). Since you have multiple horizontal rails which were designed (I assume) to introduce superior frame strength and resolution of moment forces to hinges, this condition is introduced not once, but three times in the gate…and all three areas are susceptible to rot (whether this was reason for frame design or not). I am hyper sensitive to this detail mainly because of wrestling with it myself many times before. 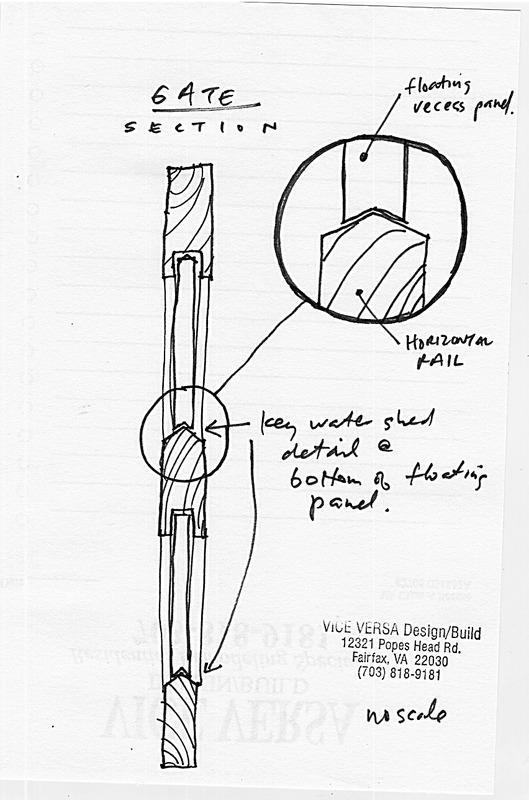 As an alternative solution I offer the attached sketch that presents a water shed for bottom rails, but still geometrically traps floating recess panes in position. I also incorporated a different water shed detail for some large (8’Hx 4’W) sliding barn doors with T&G recessed panel construction. Essentially, I detailed my horizontal rail to drain moisture with a metal flashing hidden within it. It’s worked very well for the past 4 years of exposure to rain, sleet, and snow—with no caulk and no signs of deterioration. If you’re interested in seeing photos of it, I’d be happy to send you a link…. and I would also be open to your reverse critique. Lastly, with regard to feedback, I suggest that your gate is NOT drawing due to simple material thermal expansion and contraction. Wood doesn’t work that way. It’s probably due to moisture content changes within individual boards and then is exacerbated by uneven solar heat gain. The moisture content fluctuations has to be caused by rain water trapped in “cup” oriented dados, then is being wicked up into t&g panels, then absorbed into rails, and then possibly working its way into stiles via mortises and tenon pockets. Maybe no huge amounts– but collectively enough to slightly warp the gate. This theory could be borne out by observing the amount of gate draw after extreme weather conditions; say after a bright, sunny summer days following 2 or 3 steady days of rain and drizzle. Also check it out after “drought like” conditions of a month or so without rain. My guess is the latter will result in the gate trimming out close to way it did the day you installed it. A Moisture meter would be helpful in tracking the moisture content changes as well. NICE detail! I like that a lot. Sure, it’s going to have a different “look” than the rabbeted stiles/rails surrounding it, but I think it would be an ‘attractive’ look, especially for other craftsmen!! :) I bet I use that technique before too long. I’ll try to remember where I learned it. Feel free to remind me if I forget to mention your name! That is the exact type of criticism that I like. It’s constructive and informative. So no offense taken. As to your detail, I think it’s a fantastic idea. If I ever build another gate such as this, then I’ll try to incorporate this detail. Hopefully it won’t be a rebuild for this project but instead a new one. The climate where is live is rather temperate so I can only hope that my gate lasts for a considerable time. Afterall, that was the intention. Thank you for your feedback. It’s much appreciated. You might also keep in mind that the bottom beveled rail detail works great for individual balusters within gate or railing frame construction too!. Here is a photo of some 3/4″ thick x 1-1/2″ wide w. red cedar balusters cut with a 10 degree pitch from center line of thickness . Festool Domino mortise pockets are then drilled to accommodate a sipo tenon which then locks them all in desired position on beveled bottom rail. I make my mortise pockets on bottom rail first, then cut the 10 degree matching bevel. This allows the tool to seat better then if you cut the bevel first…and reduces tear out on the more fragile “ridge” line of bevel. Note:I adjust the mortise in balusters a little deeper to accommodate loss of mortise depth due to bevel. Another comment to William’s point about moisture being trapped in the dado. During the 10+ years that we were building gates, when there was a floating panel, it was set into a dado’d area without any glue/caulk etc. On the dado at the bottom of every panel, we drilled thru-holes for drainage all the way down through the bottom rail (all of these were mortise&tenon door style construction). This was learned after a driveway gate floating panel ‘blew up’ after El Nino rains. It only took one time to learn that lesson! But after the drainage holes were integrated, we never had any issues at all. I don’t need to add much to the above comments. It speaks for itself when someone cares about the long term durability of any project while also designing it to look good at the same time. A further note on the beveled rail detail. One could also use a tongue on the rail that would be a little longer than the adjoining groove on the panel itself therefore leaving a small (1/8″) gap at the bottom of the panel yet leaving a square shoulder like the stiles. You may encourage watershed by slightly beveling the shoulder with a hand plane or such. That would be the only worry I would have about the integrity of the gate. The caulk may seal the moisture in instead of keeping it out depending on the exposure but any damage may be avoided with careful observation and some creative work. Great looking design and work! I sort of get your idea on tongued bottom rail, but not sure how that would work for a recess panel. Would you have sufficient panel thickness to pull that off? Do you have a photo or sketch of that detail we can review? Fantastic project, excellent execution, and great collorborative thinktank. If you ever find yourself bored with mixing sound, you certainly have the mind for contracting. Although, I doubt you’ll make as much money. That gate, and moreso the foundation you built to accomodate it is outstanding. Sure, you discovered a design flaw along the way, made a mistake or two. Everybody does. Your documented resolution of those errors is of great interest, and I for one appreciate thier inclusion in articles like this. Those types of resolutions, not matter how well a project may be thought out, are a part of every (at least mine) project. I also found your critisism valid, compelling, and informative. As doors are my primary business, I’m constantly seeking advancements in build construction. I like your watershed assembly and may have a way to incorporate that rail/panel design into your watershed rail. I’ll work on it and if I can come up with something that works I’ll post it up. Remember the mantel sticking detail that lead to the trigliph assembly technique? Think it’d work here?? I have spent too much time trying to find an answer to the “upward facing panel groove” issue. I am building a frame and panel garden gate in the near future and I was extremely concerned about that issue in the climate here in Boston. I am going to use the construction method suggested by William, or a modification of it, and I’ll try to remember to post the result. This project is absolutely ridiculous! For an amateur, your work is excellent. As a contractor myself I am very envious. Although I do understand the difference in your expectations vs. what the average contractor can afford to bid and/or build. Unless you were absolutely clear that you wanted to pay for extreme quality. Excellent job! I’m truly inspired. Very proud of you! I sure hope this doesn’t sound too trivial but I wondered why you didn’t copy the arch of the garage doors and why the color of the gate was different? Not trivial at all. Both points are valid. As to the arch, I don’t have a great answer except that it was one detail I didn’t consider at the time. Then there’s the color. Believe me when I say we tried, but this was a huge pain in the arse!!!! The garage doors were painted yet I wanted to use stain on the gate. We made three attempts to have the color matched at Anawalt Lumber where we bought the stain, but were unsuccessful. No matter what they tried, the color looked a lot worse then the stock color right out of the can. So yeah…I’m not too happy about the mis-match. Four years ago we were looking to replace our back gate and came across your article. It was a great inspiration. We used standard pressure treated spruce and added a bit of a pergola up top. It swings on three stainless steel hinges. I re-stained it a few weeks back and was happy on how well it has stood up to cold Canadian winters as well as a couple of really hot summers. Thanks for posting your great step-by-step tutorial. Wow! Chris, that looks fantastic!!! Well done.